I found these small packs of foam letter and number stickers at the Target dollar spot. I used them to make a quick puzzle for B to practice putting numbers and letters in order. 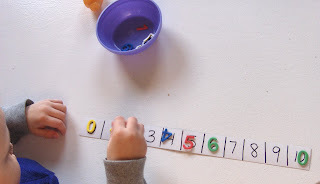 The first few times he worked on matching up the numbers and letters, he just set each one on top of the cardboard strip. Later on to add some “excitement”, I had him actually stick them on. Hi! I just discovered your blog (via Our Nifty Notebook) and I must say you have great activities here 🙂 I’ll probably use some in my classroom. oh, perfect! i have a TON of stickers to use up including abc and 123 ones! i am going to do this! This is great! Thanks for your great ideas. I will be using them for my Kindergartener. I was trying hard to come up with something similar to this, but you hit the nail on the head. Thank you so much!! I love the Target dollar spot. So many great things to get there. I recently “found” your blog and love all the super ideas you post on here! What a wonderful idea! I just picked some of these stickers up @ the $1.00 section of Target yesterday! Great way to use them to teach my jumping bean his ABC’s in a few months. I love your blog – what a blessing it is to our family! You definitely have a gift! Ohhhhh, I’m totally doing this with Maddie! We have those exact same stickers (what DID we do before the Target dollar spot?!). Off to prepare it right now… Thank you!!! Great idea – we might do it with a twist, but I am off to pull out those stickers too. Hi, I am also one who just discovered your blog and it looks like you have some great activity ideas here. Thank you. I have some similar foam letter stickers, so we may find some time to do these soon. The only thing we have done with them so far, is I let the girls stick them on to paper randomly, then we think of a word for each letter and I write it down using the letter as the first letter of the word. I just bought some of those same stickers. Don’t you just love the Target dollar spot? Thanks for the idea. I think my kids will love it. By the way, I just noticed that I won the melissa and dough cookie set. Our computer has been broken for the last week (we just had to pay a small fortune to buy a new charger for it) so if you sent me an email I didn’t get it. Is it too late for me to still claim my prize (I never win anything!)? =) Thanks. 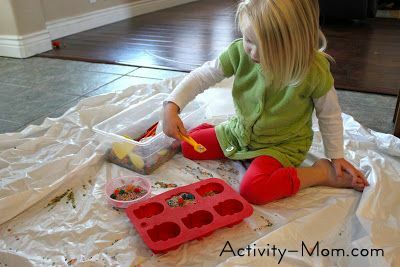 I did this with my kids last week and they both loved it! I was surprised at how well my 2-year-old was able to match up the numbers and letters by herself. I guess I need to step it up. Thanks again for the great idea!